A Spoonful of Spit Up: Gibson's tricks, and a giveaway winner! 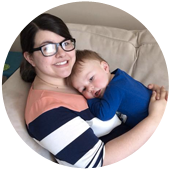 Congratulations to Christa P. for winning the Mommy's Club giveaway! I'll be contacting you soon, so be on the lookout! For those who didn't win, you can purchase Mommy's Club products >here<. They're fantastic, and you should all have them! I've been working on teaching Gibson a few "tricks" lately. ...like a dog. Except way cooler because he's a human! Right before his birthday I taught him how to hold up one finger when I asked how old he is...so obviously he's teachable, right? Mom: Gibson, what does Woody say? "Yeeeeee-haw!" Can you say it? "Yeeeeee-haw!" M: Gibson, what does Woody say? "Yeeee-haw!" M: Yeah, there's Woody! What does he say? "Yeeee-haw!" M: Gibson, where's your cow? M: Yeah, here's the cow! Cow! The cow says "Moooooo!" Can you say it? "Mooooo!" M: Good job, buddy! Say "MmmmmOOOO!" M: There's Ellie! She's a dog. Can you say "dog?" M: Duh! Duh! Dog! Can you say it? M: Gibson, where is the dinosaur's eye? *points at eye* Where is the eye? M: Gibson, can you show me the eye? See mommy's eye? How am I ever going to teach Gibson cool party tricks necessary life skills like pointing at eyes if he won't sit still? His friends will all be pointing at eyes and he'll just be giggling in the corner like a weirdo. But he'll be my little weirdo, I guess.